Before having kids, I was always up for cooking an elaborate meal. Even after an 8 hour work day, I didn’t mind spending an hour or more on dinner and my husband and I didn’t mind eating late if we had to. Kids change everything, though, and these Veggie & Pepper Jack Quesadillas are one of those meals that manages to please picky palates and parents at the same time–and they’re done in under 30 minutes too! Quesadillas are one of my go-to dinners because I know my 3-year-old will eat them. Normally not much of a vegetable eater, she somehow doesn’t mind them when they’re in quesadillas. (I’m guessing it’s all that cheese?) While I went with zucchini, bell peppers, and red onions, you can swap in your kids’ favorites–mushrooms, sliced snap peas and other spring vegetables, even shredded carrots will work! 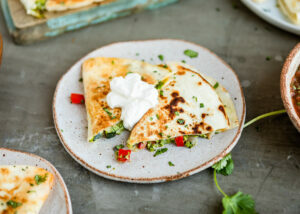 What makes these Veggie & Pepper Jack Quesadillas next level is the addition of Cilantro-Lime Pesto. 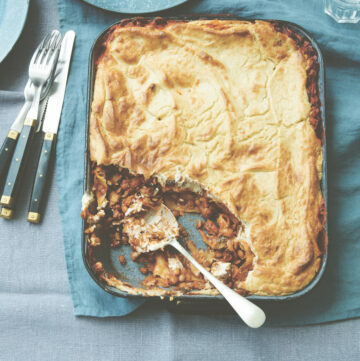 It’s a cinch to whip up and the tangy, herbaceous flavor it adds is so worth the extra 5 minutes or so of prep time. If you like things on the spicy side, add a small jalapeño to the pesto or a pinch or two of red pepper flakes. A kid-friendly dinner that adults will love too - and it's done in under 30 minutes! Combine all of the ingredients in a food processor and process until almost smooth--a little texture is nice, but you want to make sure any large chunks of garlic or almonds are gone. Heat the oil in a large skillet over medium-high heat. Add the onion and cook until softened and just beginning to brown, about 5 minutes, stirring occasionally. Add the zucchini and bell pepper; continue to cook until the vegetables are tender, but not mushy, about 3 minutes more. Season to taste with salt and pepper. 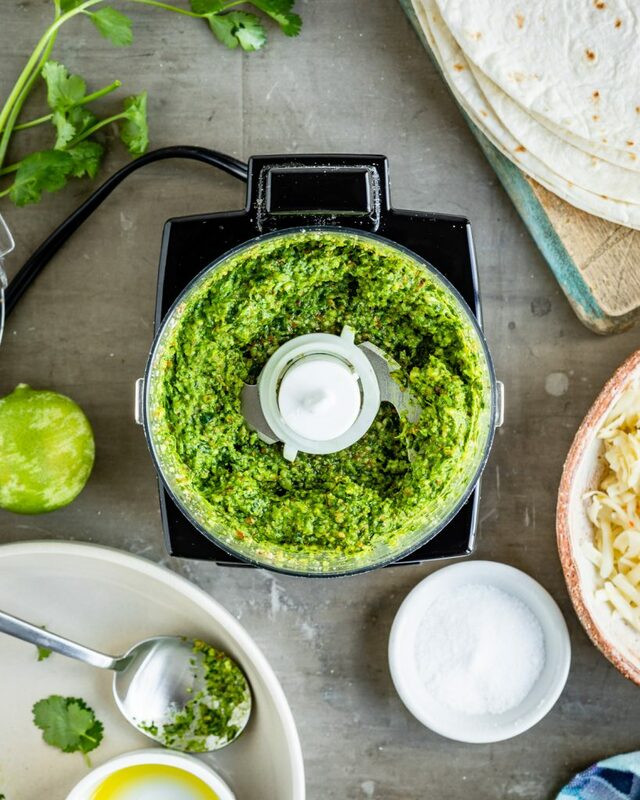 Spread the pesto onto half of each tortilla. 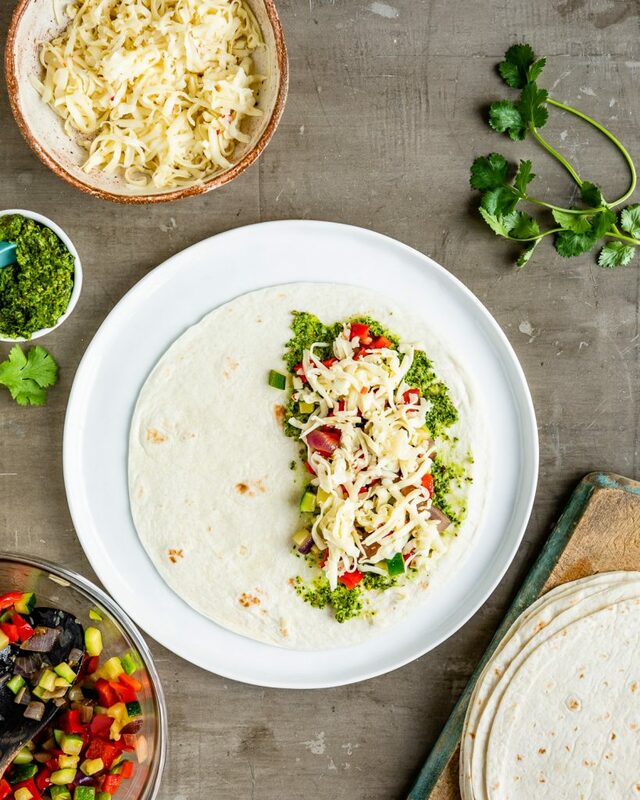 Divide the vegetables and cheese onto the pesto-side of the tortillas and fold them in half. Wipe out the skillet and return it to medium-high heat. Toast the quesadillas two at a time, about 2-3 minutes on each side or until golden brown and crisp. 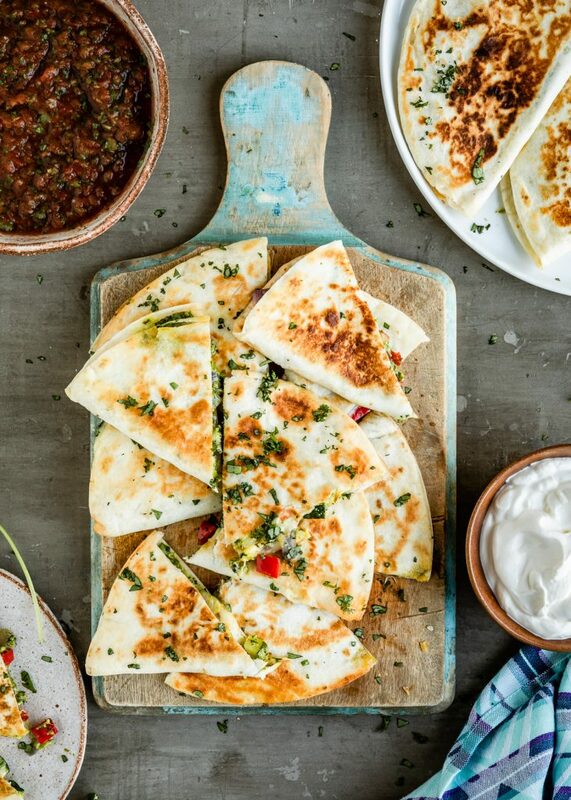 Cut each quesadilla into 2-3 wedges and serve with salsa and sour cream. 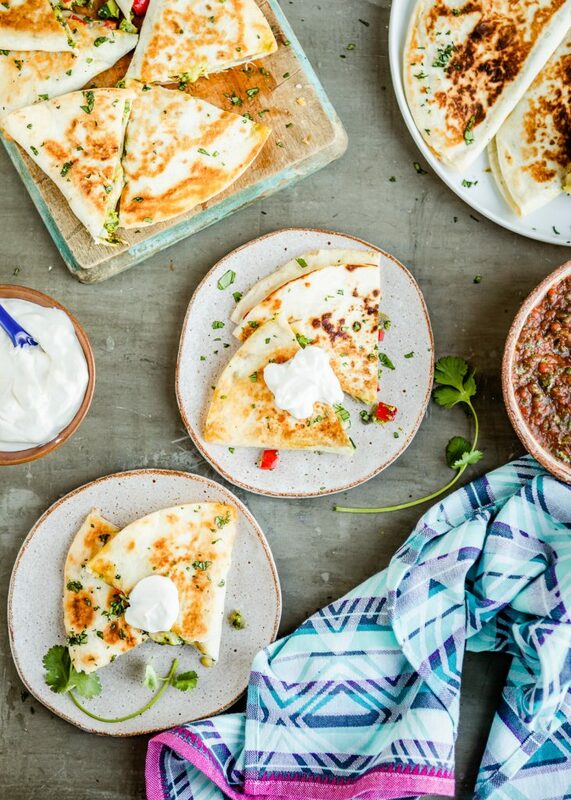 These quesadillas can be made in the oven too. Preheat the oven to 425ºF; after assembling the quesadillas, line them on a sheet pan that's been sprayed with oil or cooking spray. Spray the tops of the quesadillas then bake for about 10 minutes, or until crispy, flipping the quesadillas halfway through cooking time.